Deep changes in agricultural systems are required for adaptation to climate change impacts such as higher temperatures, more extreme climate events and increases in pests and diseases. 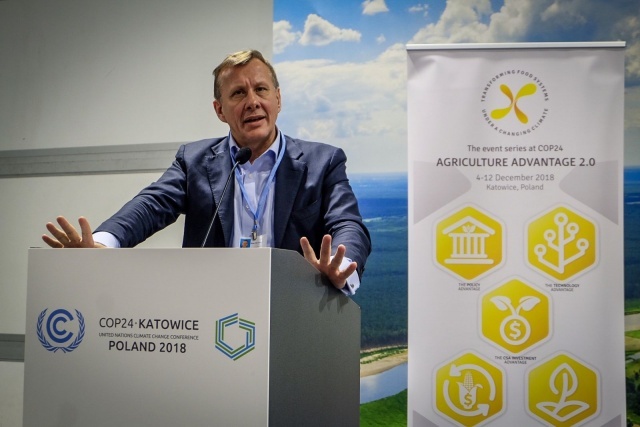 The Technology Advantage event, part of the larger Agriculture Advantage 2.0 event series at COP24, explored opportunities to tap into next generation technologies to rise to the challenge of transforming food systems under climate change. Opened by Hon. Winifred Masiko, Member of the African Gender Network (AGN) and Uganda Gender and Climate Change focal point for UNFCCC, the event covered a range of technological solutions to help food systems meet food security, and climate adaptation and mitigation goals. Moderated by Hugo Campos, Director of Research at the International Potato Center (CIP), the discussion ranged from just how transformative technological advances are likely to be, to the potential drawbacks of change. Can the fourth technological revolution help us speed up adaptation and mitigation to climate change?, asked Sean de Cleene of World Economic Forum (WEF). A new WEF report assesses the potential of 150 technologies and hones in on the impact of 12 of them. Alternative proteins and meat are one of these: if we reduced our meat intake by 10–15% we could reduce land use by 400 million hectares—the size of the EU. The CGIAR Research Program on Climate Change, Agriculture and Food Security’s (CCAFS) Transformation Initiative, presented by Ana Maria Loboguerrero (Head of Global Policy Research at CCAFS), is also undertaking an assessment of the potential of a range of blue-sky technologies to accelerate the transformation needed in food systems to meet global climate goals. But rather than develop new technologies one by one, we need to take a holistic, system-wide approach, developing a suite of technologies to respond to particular challenges. Technology may help us to keep pace with climate change, but it won’t be easy. For instance: roots, tubers and bananas are often neglected crops, but they are the backbone of farming systems in many developing countries. As a result of new climate change-related challenges—an increase over the next 30 years in aggressive potato diseases in Ethiopia, for instance—varieties currently on shelves will soon not be fit for purpose. And increased temperatures and prevalence of drought in East Africa, the predominant region for sweet potato cultivation in Africa, will also have a negative impact on production. Today we have a better understanding of plant genes, and gene editing is one of the main technologies that can provide a solution to these issues. However, this technology is not without challenges. A complex process, we must get it right, or we could end up breeding the wrong crops. Furthermore, distribution of new varieties must take into account the diversity of the users—farmers—and their specific contexts and needs. The success of technological innovations depends on these users; to achieve large scale changes, new innovations need to be accompanied by behavioural change. Many governments are currently struggling to find ways to sustainably close production gaps in their countries. In some regions affected by climate change, production increasingly depends on irrigation. Solutions must respond to the twin challenges of increasing production while reducing water use. The creation of employment opportunities for youth, who suffer from high levels of unemployment in many of the most affected countries, is also an important consideration. Solutions could feature systems that incorporate adaptive rain-fed cropping, irrigation, and markets, all adapted to the specific rainfall in a given year through technologies, modeling and good quality data from the ground. The application of technology can easily go wrong, ultimately hurting the farmers and other beneficiaries it was intended to help. But when carefully considered, it can also nurture trust, openness, credibility and inclusivity, benefitting all. Couldn’t join the event? Watch the web recording (click “Join the event” to watch after the event).